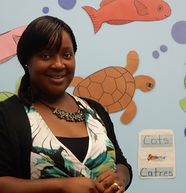 A conversation with Monisha Gibson, Co-Owner/C.E.O., Odyssey Early Learning and Enrichment Program. Q: How did Odyssey Early Learning come to be? A: I was fortunate to have served as the Director of the Naramake Family Resource Center for five years. While I was there, I often thought about branching out and having my own program. I also had the opportunity to focus on what worked well in early childhood education in our city, and on what did not. I knew that preschool was important for achieving success in elementary school and beyond, but I also knew that addressing family needs, social/emotional development and other things were also critical to a child’s early education. I asked myself, what motivates and inspires a child? How can we best engage young children so they develop a love of learning at an early age? We also thought about what resources were already available in Norwalk. 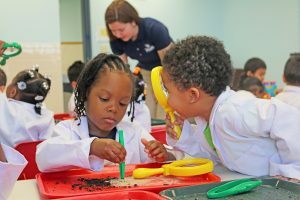 After a lot of discussions and planning about how to create a Marine STEM (Science, Technology, Engineering and Math)-based preschool program, Odyssey opened its doors at the Nathaniel Ely School in South Norwalk in August of 2016. Today, Odyssey is the largest Pre-K program in Norwalk, serving 200 children (160 preschoolers and 40 toddlers) plus 70 on a waitlist, 75 percent of which qualify for free or reduced lunch. There is no other STEM preschool in the country that services low income children like we do. Q: Describe your partnership with Grace Baptist Church and the Maritime Center. Why did you partner with these organizations and why has the partnership been so successful. A: Seek, Optimize, Utilize and Love. It takes all of us, working together as a unit, to succeed as a community … we all bring different gifts to the table. The 124-year-old Grace Baptist Church is a hub for the community and for the families we want to serve. The parishioners are some of our parents and they play an important role in the childrens’ success. To help support these families, we offer workshops for parents and guardians ranging from credit repair to resume writing to basic reading skills for both English and non-English speakers. We also welcome parent participation in our school experience, especially parents of at-risk children. Unfortunately, many of these parents have not had positive experiences with schools in the past. From my first meeting with Tom Naiman, Director of Education at the Maritime Aquarium, I knew this was going to work….we were going to make the school a national model for early childhood STEM, and for how a science institution like the Maritime Aquarium can play a leading role in helping the children understand the world around them. Each day, our preschoolers visit an in-house, science learning lab. The live animals and marine life also tie into the curriculum and inspire learning in pre-literacy and math. The families also receive a free membership to the Maritime Aquarium, which is great. Our program operates like a family and we really believe that the Aquarium and the Church are family members. You can only be your best by working in collaboration with others. Q: Describe your affiliation with Norwalk ACTS. How does Norwalk ACTS’ role in the community as a Convener, Conduit and Catalyst for Change support your work? A: Norwalk ACTS is the best thing to happen to Norwalk in a very long time. For years, everyone worked on their own, focused on their individual goals and we were all afraid to fail. I do not believe that you can be your best self, your best program, your best organization by doing it by yourself. As members of Norwalk ACTS, we are part of the PreNatal to Third Grade Workgroup, TEAM Summer and other groups that meet regularly, share what works and what doesn’t, collect and share data and are all focused on common goals for our children. Q: Do you have measurement tools in place to track student outcomes? A: Data is the proof that there needs to be a shift so we can improve. Data and data sharing are critical to this process. I am part of the Norwalk ACTS’ PELI (Preschool Early Literacy Indicators) Assessment Project. (The PELI is a language and literacy assessment that measures alphabet knowledge, vocabulary and oral language development, phonological awareness, and listening comprehension). 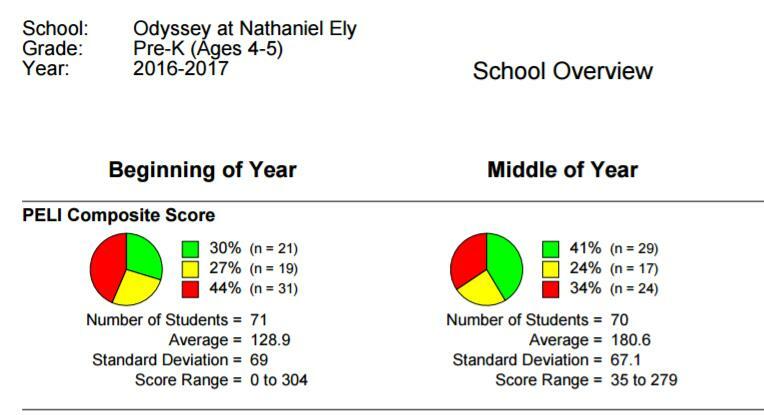 So far, we have data for Beginning of the Year (BOY) and Middle of the Year (MOY) and we are already seeing some strong results for our students. 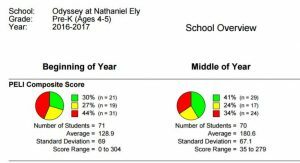 The PELI Composite Scores for four and five year olds show our students in the Green Zone increased by 11 percent, from 30 to 41. And our students in the Red Zone, or those who need the most intervention, decreased from 44 percent to 34 percent. I cannot wait to see what our End of the Year assessments show. And we are just getting started! The PELI assessment, the social emotional surveys and other student level data provided through our engagement with Norwalk ACTS will help our teachers know where every child stands. We will change it up and add interventions if necessary to make sure our students are going to Kindergarten on track and ready to learn. Q: What have the biggest challenges been during your first year and how did you address them? A: When we opened the school, more than a third of the children came to us as English Language Learners (ELL). We have 32 different cultures represented in our classroom community. I knew from the beginning that we had to change the way we teach these children. We had to shift our thinking because Norwalk is shifting. Fortunately, I had experience working with TESOL (Teaching English to Speakers of Other Languages) and TESL (Teaching English as a Second Language) early in my career and I discovered that it works. This methodology requires professional development and training, which we have been able to offer our staff. We don’t try to teach in the child’s native tongue, we get them learning in English. That’s a big mind shift. But that doesn’t mean we don’t embrace all the cultures represented here. In fact, we have a large world map at our entrance, where we have identified the home countries of all our families. We hold events with native food, music and costumes to celebrate our diversity. We are inclusive of our differences. In the end, our focus on community will make us all stronger.